Title එකෙන්ම කස්ටියට තේරෙනවනෙ මේක මොකද්ද කියලා. Avast කියන්න ඉතින් ගොඩක් අය use කරන virus guard එකක්නෙහ්. ගොඩ දෙනෙක්ම පෞද්ගලිකවම මට රෙකුඑස්ත කරල තිබ්බ මේක දාන්ඩ කියලා. එකයි සෙනිකව මේක post කරන්ඩ හිතුවේ. ඇත්තටම මම නං මේ මගුල් දාන් නැ. මේවගේ තියන එකේක මගුල් features හින්ද නිකන් machine ඒක slow වෙන එක විතරයි වෙන්නේ. ඇත්තම කිවොත් Windows 10,8.1,8 නං තියෙන්නේ Windows Defender enable කරල update කරා නං e ඇති. Windows 7 නං තියෙන්නේ Microsoft Security Essentials දාල update කරා නං ඇති. හරි එත් කමන් නැ Avast ම use කරනවා කියල තීරණය කරන යට තමා ඉතින් මේක දෙන්නේ. මෙතන Avast guard 3ක් තියනවා. Avast Premier, Internet Security, Pro Antivirus. 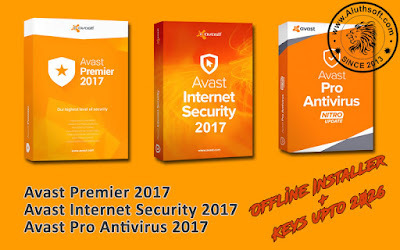 මේකෙන් වැඩිම features ටික තියෙන්නේ Avast Premier කියන එකේ. Download කරගන්න අයට 3ම තියන ඕනේ එකක් කැමති විදිහට බාගන්න. 1. කැමති Guard ඒක download කරගෙන install කරගන්න trial එකක් විදිහට. 2. Avast Serials.zip ඒක extract කරලා ඕනේ license file ඒක double click කරල open කරල yes කරන්න. Avast Offline definition updates ඕනේ නං පහල link එකට යන්න.